Green house is in fact an atmospheric warming phenomenon, in effect greenhouse gases present in the atmosphere do not allow the longer wavelength radiation to go back in to the atmosphere, they just act as a trap for the solar radiation and result is warming of the of the atmosphere. These gases are just trap the heat as trapped in the artificial greenhouse(s) for vegetables and plants, that’s why they are referred as greenhouse gases. Major greenhouse gases include Carbon Dioxide, water vapours, methane and nitrogen. Since carbon lasts long in rocks and other organic material. It is due to this property it is estimated that Carbon Dioxide stays 50 to 200 years in the atmosphere; water vapous have short life span. However, other gases stay a considerable time and cause greenhouse effect in forward direction. Sun rays, mostly in the form of short wavelength observable energy radiation, enters the atmosphere and is trapped by the Earth’s surface. The heated surface then radiates back some of that energy into the atmosphere in the form of longer wavelength radiation. While some of these radiation oozes into space, plenty of it is engaged by greenhouse gases in the lower atmosphere, which in turn re-radiate a share back to the Earth’s surface. The troposphere thus acts in a manner roughly analogous to the glass in a greenhouse, which allows rays to penetrate and warm the plants and soil but which traps most of the subsequent heat energy inside. 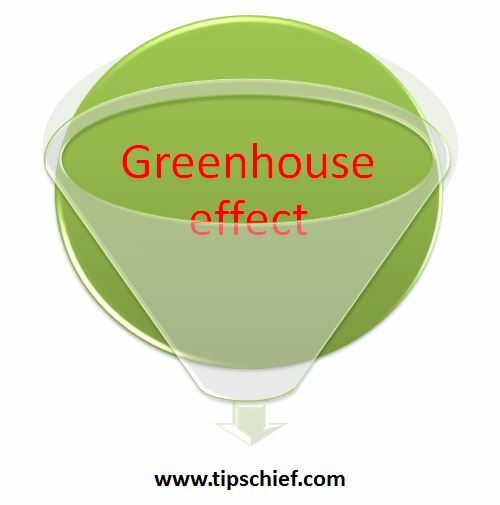 Greenhouse effect is essential to life on Earth but the increase of its effect due to increased levels of greenhouse gases in the atmosphere is considered to be the main causative factor to global warming. Greenhouse maintained the temperature level, which is responsible for existence of life on earth. Such global warming is called “natural greenhouse effect. Whereas due to greenhouse gases this process has been accelerated and causing uncertain climate changing.